Santiago carefully picks his way through the scattered cacao beans laid out on the table, making selections with a trained eye and placing them in a customised folding tray in front of him. The tray has placeholders for the beans and he fills it row by row. But this is not a tray for display. After it is filled, he folds the tray over, sealing the beans in place. The tray is designed to check the quality of the cacao beans, and it comes with its own built-in guillotine blade. A quick swipe downwards from Santiago and the beans have been sliced in half. He opens the tray to expose the newly-decapitated beans and examines their insides. Checking the bean quality is an intricate process and this is just one part. The final check is a taste test, but to get to that part requires another few steps. Santiago claims to look after ‘tourism’-related activities but he’s clearly steeped in cacao knowledge. Dressed in a CEPICAFE t-shirt and light waistcoat, he walks me through the process. From the same batch of beans we took some of the ones that had survived the guillotine and placed them in a mini roaster, separate from the ones that roast the coffee. After roasting the shells need to come off and the beans ground up. Grinding is non-technical – hand power is used. Out of that come the cacao nibs. However, the next stage uses white cylindrical tubs with numerous wires and plastic protruding skywards. Looking more like they should be in a hospital, these tubs turn the nibs into cacao liquor. Then it’s poured into small tasting trays and placed in the fridge until Santiago is ready to taste test. The day before visiting CEPICAFE, the co-op that Santiago works for, I arrived in Piura, northern Peru, on an overnight bus from southern Ecuador. After several weeks in the cooler mountains I was now in the hot, parched flatlands of Piura. Piura is the main town of the Piura region and was my base for a few days, offering an opportunity to visit a couple of different fair trade co-ops. In common with Ecuador and Colombia, my first sense of Peru was a mix of the relatively affluent and modern (gated houses, a private leisure club, cafes and hotels) together with the more chaotic hustle that characterised the markets, dusty streets and unfinished or rundown buildings of poorer areas. There is a very pleasant central square, an upmarket hotel facing onto it, and it even had a vegetarian restaurant. It was hard to believe that Piura, a dusty, hot low-lying town, could be home to a coffee co-operative. But because it is the largest town in the region, it works well as a central base for coffee and cacao producers who live in the interior. This particular co-operative, CEPICAFE (coffee producers of central Piura) is large and has a diverse range of products – coffee, cacao, panela (sugar) and fruit juices and jams. The co-op office is located just outside of the town centre and I arrived unannounced on a hot, sunny morning. Again, I wasn’t sure what might happen – and neither were they – but after an uncertain few minutes I was given the ok for a tour. This co-op is particularly unique, given its office (and warehouse) location, size and its products. Most producers live quite a distance away up in the high hills but this location in Piura is a step forward. They have a modern operation here and my first glimpse of it was with a young lad called Ivan, who showed all the equipment they use to make batches of fruit pulp for jams and juice. Alas it was out of season so I didn’t get to see the operation running. The main emphasis of the co-op is in cacao and coffee. It wasn’t coffee harvest season either, so when I first saw the massive warehouse it looked noticeably empty. Only four years old, it was the largest facility I’d seen on my trip; at harvest time they process a huge amount of coffee. But when it’s not coffee season there is the cacao. The hub of the action, and the fun, is in the quality lab. The lab is at the upstairs in the warehouse and is used for coffee and cacao tasting; today it was cacao. Very high quality cacao is produced within the co-op. According to Santiago Paz Lopez, the co-op Manager, “we have some of the best cacao in the world”. calls it the gold of Piura, such is its quality and value. One of their varieties of cacao won 1st in a national competition. Earlier in the day that I was there one of CEPICAFE’s US clients visited – a well-known fair trade chocolate producer who have exacting quality requirements. The warehouse was on the other side of town, so I accompanied Martin there on a tuk-tuk ride from the office. He explained to me that the co-op handles a range of different standards of coffee. Most carry an organic standard as well as one or more fair trade certifications (e.g. FLO, CLAC). Martin had been with the co-op for 12 years and as we wandered around the warehouse he was happy to talk to me for a while about the co-op. However, because my visit was outside of coffee harvest season, the warehouse had an air of slumber about it, except for when we arrived at the quality lab, which was crowded and alive with activity. Back in the lab, I watched intently as Santiago and his team put the cacao through its paces. As well as conducting the ‘guillotine’ test the cacao needs to be given clearly it’s most important test – tasting. Who could refuse? Santiago was ready to give the liquor a try. The chilled liquor was softened (in the microwave) and after a few seconds he handed me a little tasting spoon and I dived into the softened cacao. We tasted two varities and I was surprised how easy it was to notice the difference. Despite that, I had to make sure and I was keen to repeat the process…several times. By the time I reached picturesque, beautiful Loja in southern Ecuador I’d had a wide range of fair trade experiences throughout the country. But I couldn’t leave without making a trip to a fair trade coffee co-op. 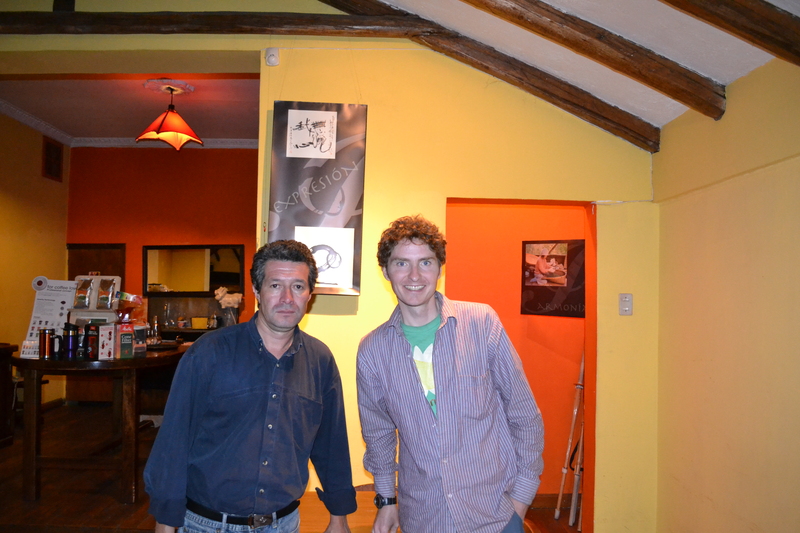 Loja is home to an umbrella group of seven co-operatives called FAPECAFES. One of those co-ops was APECAEL. I spent a couple of hours there getting to know the organisation and the people. Housed in a modern building within the town, the office looked as typical as anything I’d see in Canada. During the afternoon I arranged a visit for the following day with Roger, a forestry engineer, to visit some producers of the APEACAEL co-op located out in the countryside. Bright and sharp the next morning I met Roger at the bus terminal. It’s the way to get around of course, cheap and pretty easy. The small, comfortable bus wound its way up through the green hills and then down into San Pedro de Vilcabamba, the picturesque little town where the sparse, one-room office of the co-op was situated. A lone computer, printer and scanner sat on a formica table with a couple of plastic chairs. When we arrived, Sandra, a large grumpy woman wearing sparkly pink toenails came across. She was clearly angry about something, much to Roger’s bemusement. But after five minutes we headed out to visit some producers. Roger, young-looking, is married with two children. He had an easy laugh and got a lot of enjoyment talking about music and nightclubs. Sometimes the world doesn’t seem so different after all. This was my first visit to coffee producers in Ecuador and it was definitely different. We made calls via taxi to just two producers. These producers were easy to get to being just a little way out of town. The producers process and dry their coffee at their homes. There is no communal processing facility that was typical in many of my other visits. Although still basic, the homes here tended to be of a higher standard than what I’d seen in Central America. Slate roofs were common. We visited Elsa first, but it was a short visit with her and Roger chatting intently for most of the time. The coffee processing was different to what I’d experienced. Behind the house was a plastic covered greenhouse type of frame where the washed coffee was laid out to dry, resembling a hostel room full of bunk beds. Elsa looked a little worn out, dressed in a dark apron and baseball cap. Her young son hovered around us while we chatted, hiding his face in his green flag for most of the time. Their ginger cat remained highly unimpressed with us, sunning itself on the roof. After Elsa, we had an even shorter visit to another producer. Again, this one was unique. A couple of men washed their coffee in large blue plastic barrels, swirling it around with long wooden poles. They smoked as they worked. The coffee here was drying out on cement patios rather than the raised beds such as at Elsa’s. The depulping of the coffee (separating the bean from the cherry) is done manually using a small machine with a handle that is turned by hand to push the coffee between two rollers. In Honduras I visited a couple of farmers who produced high-quality coffee at their own homes rather than via the co-op. Their equipment was superior to the mish-mash of rudimentary and improvised equipment I saw here. Our third and final visit was to see Daniel Castillo, a ‘microlot’ seller. Microlot coffee tends to be produced in small quantities but is high quality and typically gets a higher price, often higher than fair trade. We spent the most time here and took a walk along the road to his finca. Daniel, an older but genial man dressed in short-sleeved shirt, casual trousers and sandals, walked us up a short track to get to his plot, which is about one hectare (a typical size for millions of smallholder coffee producers throughout the world). He produces organic coffee, though it is not yet Fair Trade certified. His coffee is ‘shade grown’ under a diverse range of other trees and plants, such as yucca, banana and citrus. Daniel has 3,000 coffee bushes. Roger explained that Daniel gets his coffee to a higher quality after the harvest, when he is able to take extra care with hand processing techniques. The coffee is dried on small, elevated beds rather than directly on the cement patio. This allows for better air circulation to improve the drying process. We sampled a couple of seed-filled oranges before heading back to Daniel’s house and then back on the small bus to Loja. We discussed fair trade. Of the seven co-ops within the FAPECAFES umbrella,only this one, APECAEL, is not certified fair trade. They were currently underway with licensing process for certification. It’s a process requiring significant preparation and then approval by the co-op membership and it would take several more months at least. Roger does support fair trade but had reservations about whether it was worthwhile. Different fair trade labels exist with different criteria and license costs so he wasn’t sure which one would be best for the producers. However, he expected the co-op membership to grow in future and the evidence was already there in the other six co-ops within the FAPECAFES umbrella. My visits to coffee producers throughout Central America had exposed me to the realities many producers face in their day-to-day lives, whether or not they are fair trade producers. I was able to see the complexities involved and the hard decisions needed in how best to improve the lives of them, their families and communities. For the producers here in Loja, it looked like fair trade was still the best option. However, unlike many other producers I’d visited, they seemed to have other options based on their ability to produce high quality coffee, which attracted good prices. The families in Roger’s co-op could benefit from the experiences of the other co-ops. However, the producers were worried about whether it is worth the cost. The most well-known certification (FLO, the blue-green and black label which is the most common) has a higher cost. In response to this, over the last several years another certification is being introduced that was created in Latin America, for Latin Americans (the Small Producer symbol, SPP). It is still little-known, but it is important. For many consumers, they feel it is enough to simply buy a product with the fair trade symbol. Of course, it’s a little more complicated than that, and my hope is that fair trade continues to evolve with the interests of the producers at its heart. The main thing is to support it as best you can. In individual cases fair trade may not be the best option. One year of high prices may be great for producers. But in coffee (and other commodities) the price fluctuations can play havoc in producer communities. Over the long-term, fair trade still offers a positive path towards a sustainable means of living for the people in these communities. But there are still risks. For the producers of APECAEL, they will pay out the costs of obtaining a fair trade price without the guarantee they will be able to sell all their coffee at fair trade prices. For them, for now, it’s still a risk worth taking. It is up to us to make sure that the risk pays off. There’s a hat for every occasion, though when it comes to fair trade hats made at the ATMA women’s co-op in Sigsig, southern Ecuador, traditional is the style. This following article originally appeared in the January 2013 edition of “fair trade”, a magazine published by the Canadian Fair Trade Network (CFTN). I knocked on the heavy double door of the former hospital building. When the door opened, Rosa, the stalwart matriarch of the co-op, welcomed me. She wore one of the cooperative’s panama hats with a black cardigan and red skirt. Her braided hair gave her a traditional Ecuadorian look. She welcomed me with a smile and insisted that I join the workers for a homecooked meal. It was yet another example of the hospitality and generosity of time I experienced on my travels. I was nine months into my Fair Trade journey, riding my bicycle from Vancouver to South America, visiting as many cooperatives as I could. I wanted to learn more about the people living in producer communities, and how Fair Trade plays a role in their lives. The Asociación de Toquilleras de María Auxiliadora (ATMA) is a women’s Fair Trade cooperative that produces artisan crafts, and in particular, panama hats. It is located among the beautiful Andean highlands of southern Ecuador, on the edge of the dusty, patchwork town of Sigsig, a 90-minute bus journey from the colonial city Cuenca. Inside the old building, there was a central courtyard, almost filled by a wooden structure with a wide central column, which was decorated with a colourful ribbon to make it look like a hat. It stood about three metres high and 10 metres wide and was really a circular table that could also be used as a stage. I made my way into the main working area, where a thrum of activity was already underway. The workroom was open and well lit by the large windows that stretched the length of the room. This was not some factory-style operation. The women worked busily at their own stations, but the atmosphere was relaxed. Most of the noise came from a mix of machines and children. Eight to 10 women typically work here, eight hours per day, Monday to Friday. During busier times, they’ll work Saturdays too. On the edges of the clean, tiled floor, the walls were lined with shelves and cupboards full of hats in various states of completion. Tables were piled high with materials. The panamas are made from palm-like grass from the Pacific coast. The style was originally named after the coastal city of Montecristi, but they became known as “panama hats” when they were given international visibility during the construction of the Panama Canal in the early 20th century. The women use many different dyes to colour the grass straw and then hang them in bunches to dry. The traditional hat weaving, an important traditional local skill, is meticulously completed by hand. The women continued to work while I visited. Their sewing machines rattled as they stitched labels onto the finished hats. Every minute or so there was a loud hiss of decompressed air, as a woman named Maria moulded hats into different styles. Another woman helped to shape the hats with an iron. Meanwhile, a group of children ran in and out of the room, playing games. ATMA provides many benefits for its employees. It offers them fair wages and provides health benefits and educational assistance for their children. Because of ATMA, important cultural knowledge will be maintained and transferred to younger generations. What’s most important is the sense of empowerment. The women here have created their own business, invested in training and equipment, and are earning their own incomes. The cooperative also has its own shop that sells hats, bags, and crafts. It felt good buying a hat straight from its source. I was satisfied, knowing my money went directly to the women here. It might be a small contribution, but it’s important. It’s fair trade alcohol, but (sorry to disappoint you) not the drinking kind, at least not yet. Alcohol has many other uses, so when I met Carlos Cabrera in Quito, the capital of Ecuador, I was keen to find out more about how alcohol production fits into the fair trade picture. For Carlos’s organisation CRACYP, their fair trade alcohol is produced for cosmetics. Leaving Colombia, I travelled a little of the backbone of the Andes and wound my way to Quito. It sits snugly in a scenic valley at 2,800m above sea level. Hills of varied gradients radiate outwards on all sides. I liked it immediately. The city comprises a mix of the colonial and modern, with spacious parks and boulevards giving breath to the confined, historical centre. I met Carlos Cabrera, the General Manager of CRACYP (Rural Reforestation and Progress Network Corporation), in the tourist district. CRACYP is a non-profit organisation founded in 1999 that works with more than 200 communities (many indigenous) in the poorer regions in the south of the country. Their mission is Progreso Verde (Green Progress) that promotes sustainable, environmental development for these people. Their communities produce a diverse range of crops, not just sugarcane for alcohol. Cacao (for chocolate) and coffee are produced in-house as Fair Trade. Other initiatives include ecotourism, community banking and youth development projects. When I met Carlos in a quiet cafe one afternoon he told me more. With CRACYP’s help, a sugarcane cooperative was formed in 2003. This cooperative, CADO, helps 280 families. Over the years training and technical development have enabled the coop to produce alcohol for many purposes, including perfumes, cosmetics and now liqueurs (surely the best part!). Clients include the Body Shop and since 2011, Dr. Bronner’s, when Fair Trade certification was obtained. Fair Trade certification gives these communities a helping hand. And at the same time, it gives the families here a chance to maintain their way of life, producing alcohol in an environmentally and socially responsible way. But despite benefits such as higher prices and community ‘social premiums’, life is still incredibly tough for these families. Carlos told me that the current season had been one of intense rainfall, which wiped out some crops and reduced the quality of the ones that survived. The community still lacks the capacity to produce more and many children find it hard to access good educational opportunities. Fair Trade certification helps overcome these problems, but it is a long-term project that requires patience and relationship-building from North American and European clients. Carlos is based in Quito as it is easier for him to deal with the various clients, NGOs and government groups that are part of developing and promoting the organisation. As such, he’s a busy man and our meeting was rushed. Despite looking tired, he was animated and excitable with years of knowledge and experience behind him. I only got a brief insight into the organisation, but I was grateful just for that. My plan from Quito included visiting some of the cooperatives we talked about. But in keeping with my travel experience there were glitches ahead and I wasn’t able to make it there. So I missed out on seeing some Fair Trade alcohol first hand. Pity…by this time, I’d got used to such things. Once again, I dug my map out, tracing the road south looking for my next Fair Trade port of call.